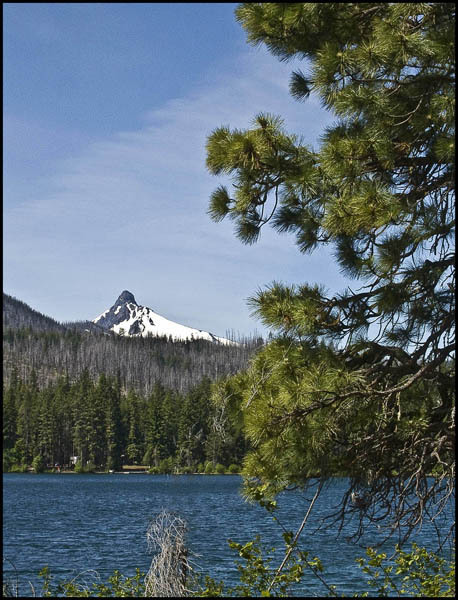 Suttle Lake is located just south of Highway 20 about halfway between Sisters and Santiam Pass summit. I suggest beginning your hike at the day use area a little past the Suttle Lake Lodge and hiking counter-clockwise. The first half of the loop is not served by a road, but the last half skirts close to the lake past boat launches and campgrounds. I was impressed with the variety of flora there, and I found species that one would expect to see on both the western and eastern sides of the pass. There are the pines, of course, both Ponderosa and Whitebark. I saw Douglas fir and the true firs–Grand fir and Subalpine fir, as well as Incense Cedar. Deciduous trees included Alder and Vine maple. There were many shrubs as well. There was not a huge variety of wildflowers, but I noted a lot of wild berries of one kind or another, and on the second half of the loop, a great many windflowers and Queen’s cup.